-Read the excerpt below from Sean Long's Media Research Center post. 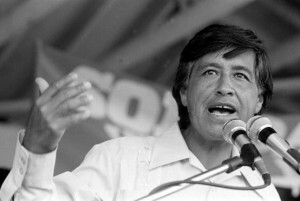 César Chávez’s was a 1960s and 70s union leader who promoted unionization and Californian farm workers’ strikes. The farm workers of the time were predominantly Latino. He is particularly famous for the Delano grape strike: a five-year strike and boycott against Californian grapes. Liberals seized on this boycott, as well as several high profile hunger strikes, to promote Chávez as a symbol of immigrant and Latino rights. Even today, prominent media outlets often praise Chávez, just as they lauded his movement during the 1960s. With the new biopic, “César Chávez,” being released on March 28 ahead of his March 31 birth date, immigration activists have once again begun invoking his legacy. However, Chávez reportedly compared La Raza to Hitler and called for increased enforcement against illegal immigration but liberal media outlets ignore these statements while using his legacy to promote their own agenda on immigration and identity politics. Throughout the Delano grape strike, print media such as The Washington Post and The New York Times endlessly touted Chávez’s role in the labor movement. On June 17, 1968, the Times praised the “inspirational leadership of Cesar Chavez” in promoting labor unions. Modern politicians including President Barack Obama also praised Chávez. On March 19, 2014, the National Review reported that Obama called Chávez “an American hero” before a White House pre-screening of the upcoming film on the labor leader. Such liberal praise completely ignores Chávez’s criticism of many contemporary liberal positions on Latino rights. Of course, the Times concealed the extent to which he opposed illegal immigration by simply calling it “complex,” when in fact, Chávez demanded government crackdowns on illegal immigration and actively denounced illegal immigrants. In his post below, Sean Long writes: “With the new movie, “César Chávez,” released on Friday ahead of his March 31 birth date, immigration activists have once again begun invoking Chávez’s legacy. Ignoring his actual views, the media have also linked Chávez to the fight over illegal immigration and amnesty. What type of bias does the excerpt below highlight? It is an example of bias by omission and spin. The media choose to ignore the fact that César Chávez fought for the rights of farm workers (many of whom were Latino) but he opposed illegal immigration.